It is surely an homage to success when a wine is so well-known, so ubiquitous in nationwide distribution channels, that it's shadowed by its very own pun, popular among wine snobs: "Silver Joke." But the numbers are in favor of Silver Oak fans, who showed up to cheer on the winery in every corner of the United States during a 2012 tour across the country to celebrate its 40th anniversary. 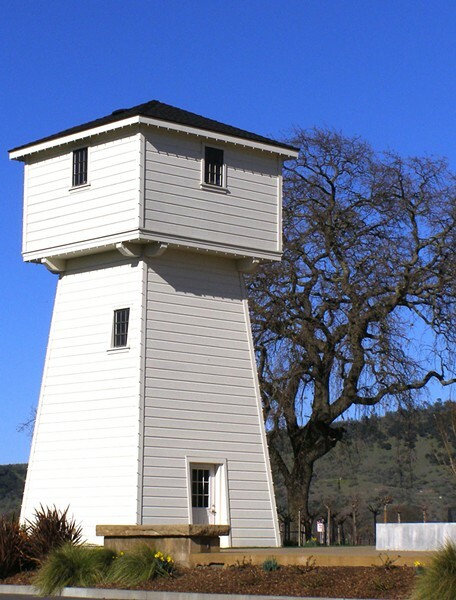 In the starring role, a 12-foot "mini-me" replica of Silver Oak's trademark water tower was hauled from state to state on a trailer, and posed for photos on the National Mall, under Yosemite Falls, overlooking the Grand Canyon, tagged on Cadillac Ranch. Mini-me inspired impromptu parking-lot parties, took third place in a Fourth of July parade and called on special fans like Utah's tattooed lady, who sports a full-arm logo in memory of her father, who liked his Silver Oak. What inspires such devotion to a wine? Let's start with the tower. There is no tower. Well, there is and there isn't. When Ray Duncan and Justin Meyer founded Silver Oak in 1972, they chose to model their label after the venerable Chateau Latour—with a Napa Valley twist. The towers that you see today—one each for the Oakville and Geyserville locations—weren't built until much later. When I peer inside, it appears to be empty, except for a humming pump churning out water for the fountain. The Oakville winery, rebuilt in 2008 after a fire, is a handsome structure of reclaimed stone from a Midwestern mill. The interior is suggestive of an abbey, the destination of a pilgrimage. Inside a temperature-controlled shrine, colossal corks lay aside outsized bottles, while hundreds of library vintages shimmer on the walls. Silver oak trees grow in Australia, and have naught to do with this Cab shop; it's named for Silverado Trail plus Oakville Cross. So there's no oak? No, there's oak. A lot of it. The custom-coopered barrels are, famously, all-American oak, mostly all new. I enjoyed the softness and appealing vanilla, savory olive aromas of the 2003 Alexander Valley Cabernet Sauvignon ($95) somewhat more than the dusty 2008 ($70). The 2008 Napa Valley Cabernet Sauvignon ($110) showed similar, dusty wood notes, a bit of olive and graphite, and flavors that melded nicely together in a mélange of somewhat understated Cab characteristics. "This wine affects people in deep ways," my host interjects. Of that, I have no doubt, and in that respect, Silver Oak truly is a cult wine, confounding, perhaps, to outsiders who don't feel the magic. Silver Oak Cellars, 915 Oakville Cross Road, Oakville. Monday–Saturday, 9am–5pm; Sunday, 11am–5pm. Tasting fee, $20. 707.942.7022.